When will be Beg, Borrow & Deal next episode air date? Is Beg, Borrow & Deal renewed or cancelled? Where to countdown Beg, Borrow & Deal air dates? Is Beg, Borrow & Deal worth watching? Two teams each consisting of four players, were dropped off in Times Square New York City without any money, credit cards or any other resources - with only their driver's license and the clothes they were wearing. Their goal - be the first to complete 10 tasks from a list of 40 and get to Al Capone's cell on Alcatraz Island. 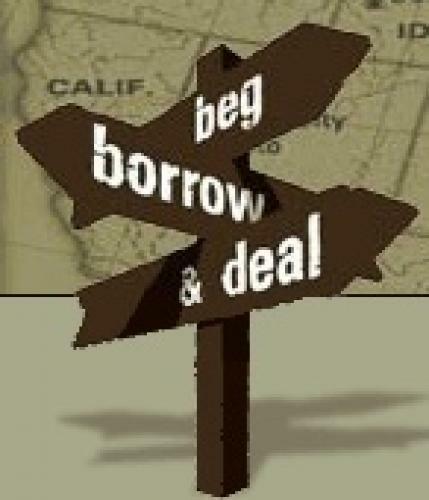 Beg Borrow & Deal their way across the continent! The goal of each team will be to finish 10 Tasks chosen by the team from a list of 40 which will be given to the team at the time they are dropped off. Teams may complete no more than five (5) Tasks in each U.S. time zone. Teams can complete a maximum of 1 Task in any given state. The Contestants will be required to travel together with all members of the team at all times. Contestants are required to rest for at least six hours out of every day. Contestants may receive non-monetary assistance from any third-party source, including friends and relatives. All contributions or assistance must be completely utilized or disposed of within twelve (12) hours of receipt. For example, a Contestant may not use a donated car during a period longer than 12 hours after receipt nor may a Contestant stay in someone's house for longer then 12 hours. A team may receive non-monetary assistance only once from any particular person or entity. For example, a team may use a car owned by a friend, family member or stranger only once. In the event the friend, family member or stranger gives the contestant a stick of gum prior to getting in the car, the contestant would not be permitted to use the car as the stick of gum would serve as the one favor or assistance. If a Contestant obtains lodging, he or she is permitted to use or consume any item owned by the person or entity owning or leasing the lodging, if that item is and remains physically located at the place of lodging. For example, if a Contestant obtains lodging in a friend's apartment, during the permitted 12-hour stay, the Contestant may also consume food and use toiletries owned by the friend, and use the friend's telephone and computer. The Contestant may not use the friend's vehicle (as this would involve off-premises use). The "run-of-the-house" rule does not extend to any item not at the place of lodging at the time of the Contestant's arrival (e.g., the friend can't go shopping or order pizza for the Contestant). Contestant staying at a friend's apartment may not use the phone to call another friend to ask for assistance. EpisoDate.com is your TV show guide to Countdown Beg, Borrow & Deal Episode Air Dates and to stay in touch with Beg, Borrow & Deal next episode Air Date and your others favorite TV Shows. Add the shows you like to a "Watchlist" and let the site take it from there.